The latest breakthrough in battery technology is a variant on the lithium-ion cell that not only takes up far less space than current alternatives, but which also charges to almost full power in just a few minutes. Toshiba's Super Charge ion Battery, or SCiB, is to be used in electric and hybrid cars at first, but will also find a niche in industrial vehicles like forklift trucks. Applications in consumer electronics are eventually possible, although they aren't part of current plans. 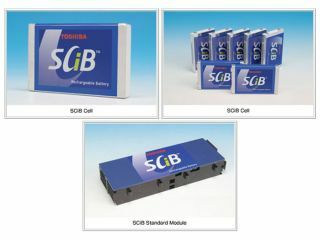 The SCiB is about a third the size and weight of equivalent batteries currently used in hybrid cars like Toyota's Prius, so the appeal there is clear. Throw in that super-fast charge cycle and the technology adds a lot to the appeal of alternative power in our vehicles. As well as the time- and Earth-saving qualities of SCiB cells, they also have a long lifespan that stretches to 5,000 charges over ten years. With production starting in March, Toshiba clearly has a head start on its competitors - the company predicts ¥100 billion yen (£440 million) in annual SCiB sales by 2015.